The bright colors of the various poison dart frogs serve as a warning to potential predators. Coral snakes, wasps, and monarch butterflies are other examples that exhibit this warning. Although these frogs are less than an inch long, they are one of the most poisonous animals on earth. Through its skin, it secretes a toxin that makes it taste very nasty to curious predators. They received their name because Choco Indians in western Columbia used this toxic secretion to poison the tips of their blowgun darts they used to hunt with. Simply rubbing a dart across the body of the frog is enough to transform it into a lethal weapon. Although various frogs have varying levels of toxicity, one example is the Golden Poison Frog (Phyllobates terribili) that lives in Columbia. They excrete a steroidal alkaloid from skin glands that is deadly to small animals. The action of the toxin is that it blocks neuromuscular transmission, which results in muscle and respiratory paralysis and death. Approximately 136 mcg is all that's needed to kill a 150-lb. person. The minute amount is roughly equivalent to the weight of 2-3 grains of table salt. Pretty deadly for such a small creature. Despite being considered the most poisonous of frogs, the Golden Poison Frog would not kill a human just because he touched it in the wild. The poison cannot permeate human skin. However, if you've got a cut on your skin or you put your hand in your mouth, you can say goodbye to this world. The toxins of Costa Rica's 7 species of poison dart frogs are not as venomous as their Colombian relatives, but they still serve to defend the frogs from predators. An animal that feeds on any is likely to suffer from violent sickness or death. Much research has been done here at La Selva Biological Station, and other jungle areas, on frogs. Dozens of new species has been found and up to 300 alkaloids from their skin have been identified. Since they relate to neurological and muscular disorders, research is aimed at better understanding how they might be beneficial medically. 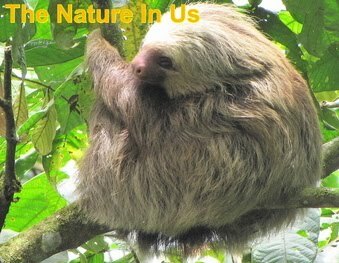 Such discoveries in animals and other tropical species (animal and plant) are among the many reasons for preserving our tropical rainforests. In Costa Rica there are 7 species of poison dart frogs. An astounding discovery revealed that the female Strawberry Poison Dart Frog (Dendrobates pumilio) lays unfertilized nutritive eggs in the bodies of water to feed their young tadpoles. This is the only case on record of a vertebrate purposefully laying eggs as food for their young. Adults will carry tadpoles on their backs to take them to pools of water in canopy plants, such as bromeliads, which are involved in the life cycle of many species. This climb can range from 10-200 feet up a tree. Males defend a territory by physical combat and vocalizations. Most poison dart frogs are active during the day and feed on ants and termites. While I was photographing some of these they would stretch out to grab and ant by mouth and swallow. It was rather fun to watch through the zoom lens. I LOVE strawberry dart frogs. This is the frist really good blog I have seen!good job!! Your info is slightly off. 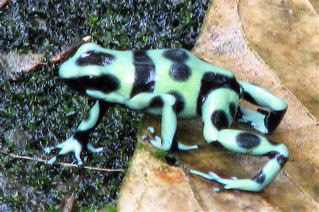 Dendrobates auratus is typically slightly over an inch in length. Also the Indians in Columbia used Phyllobates terribilis and I believe also Phyllobates bicolor for their dart tips. As far as Im aware these are the only species actually used for poisoning the dart tips. The other "dart frogs" were just lump in as such because of similar toxins. 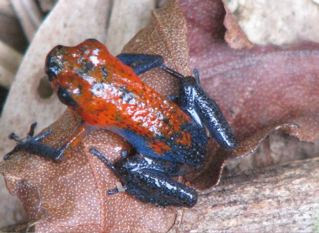 Also Dendrobates pumilio (Now in the Oophaga genus) is NOT the only recorded case of laying eggs for the youg to feed on. EVERY frog in the Oophaga genus does this. These frogs are also completely dependent on the mothers feedings and cannot be raised without the unfertilized eggs earning this group the term "Obligate egg feeders" . I believe however there has been successful captive raising of the tadpoles on surrogate egg donations from other females as well as even other species. Thanks, Anonymous! I now wish I'd recorded various sources where I found the information. At the time I was in Costa Rica with a slow connection so skipped a lot of online steps while there.